Orbital ATK produced at its Beltsville, Md.-based facility the heat pipes for a Lockheed Martin-built spacecraft that took off Saturday aboard United Launch Alliance’s Atlas V rocket in support of NASA’s Mars mission. Orbital ATK said Monday that it also produced an ultraflex solar array and diaphragm tanks for the Interior Exploration using Seismic Investigations, Geodesy and Heat Transport lander that is set to reach Mars in November. The company also supplied the composite heat shield, propellant tank and eight retro motors for the Atlas V rocket. The propellant tank and motors were produced at Orbital ATK’s facilities in California and Maryland, while the heat shield was manufactured at the firm’s Iuka, Miss.-based plant. 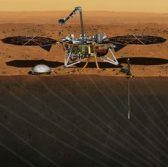 The InSight lander will study the red planet’s interior to help scientists understand the formation of Earth and other planets in the solar system.